I consider myself a recovering perfectionist. It may be easier for me to say I’m recovering from anxiety, obsessive compulsive tendencies or Orthorexia, which is true, but that wouldn’t really give you the true picture. Those issues were just symptoms of the underlying need to be perfect and feeling completely lost whenever I made mistakes or didn’t live up to my unrealistic expectations. And because I am human, that happened A LOT. Since posting the above quote and my thoughts about it on Instagram, I’ve received a couple of requests to elaborate. I think there is some perfectionism in all of us so I hope you can relate to what follows on some level. For those of you who’s perfectionism became or has become as debilitating as mine, I hope to offer my experience as to what I found most helpful in finding peace and freedom. While I may not discuss food issues per se, perfectionism is what caused mine so I do think the subject is relevant. You should know though that this discussion will likely be heavy in religious and spiritual references, because that’s a big part of who I am. In fact, I’m more than OK with sharing these thoughts here; I know I’m happiest when I am consistent between all areas of my life. Personal passion should be behind all we do and I wouldn’t be true to myself if I were to pretend that my religious views didn’t impact every area of my life, including my professional life. If you wish to read on, I’m glad to have you! Please feel free to comment below to add to what I consider an important discussion. I remember walking into my therapist’s office for our third visit. I had been having a recurring dream over the past several months and thought it appropriate to bring up. In this dream I was standing in the far corner of a large, pitch-black room. I felt alone, agonizingly afraid and completely…empty. Directly in front of me in the opposite corner was a little girl, probably about 6 years old, huddled in the corner and crying. She wouldn’t let me come near her and I could tell she felt much like I did. Across the room in the far corner there was a door that led out of the room. It was slightly open and a white, bright light shone through it. I told my therapist that after months of having this dream, it became obvious to me that what I needed to do was to pick up that little girl and carry her through the door. What stopped me every time were 2 things: the little girl didn’t trust me to touch her and I was so afraid that I would be disappointed with what was outside the door. It looked so bright, welcoming and peaceful…but what if it wasn’t? What if I chose to walk through it and whatever or whoever was on the other side, wasn’t something I could trust? That’s what perfectionism is. It’s this debilitating feeling that you have to do it all yourself, perfectly. It’s isolating, demoralizing and full of shame. You trust no one, especially not yourself. My therapist started with the first hurdle – what did this little girl represent? To make a longer story short, she was me. She represented the child inside of me, the child we have inside of all of us, who needs love. Now before anyone makes any assumptions about my childhood, I had a great one. I grew up in a stable, loving and supportive home with two parents that love me. I own all of this; I did it all to myself. She represented the fact that I couldn’t trust myself. I had beat myself up over and over and over, in the way I talked to and treated myself. It became obvious that the relationship I had to work on was with myself. I needed to show myself I could trust me and ultimately come to love who I am, deep at my core. There was no way I was going to find my way out of this dark and lonely room until I made amends to that little girl. She had to come with me; I couldn’t leave her behind. The interesting thing was that every time I had this dream, I felt completely overwhelmed by the compassion and love I had for this little girl. So that’s where we started in therapy – I started practicing self-compassion and self-love. I learned how to talk nicely to myself and how to quit listening to the critical voice in my head that made me feel like I was never good enough or worth taking care of. I also learned that I definitely needed to quit listening to the prideful and egotistical voice that made me feel like I could or should be better than everyone. Obviously I had to overcome the catastrophic, extreme, all-or-nothing mentality of perfectionism. I learned how to show up and support myself each and everyday. I had to figure out how to be my own best friend rather than my own worst enemy. How could I expect anyone else to do what I couldn’t do for myself? Once we made sense of the first hurdle, we moved on to the second. Why couldn’t I bring myself to walk through the door? What this represented for me was giving up “control”. Inside the dark and lonely room I felt in control. It wasn’t pleasant but it was familiar and I knew how to handle it. I had my lists and my rules and my safe foods and my numbers and my check boxes and other rigid methods that I felt kept me safe, unseen, untouchable…and somehow getting closer to perfect? Ultimately, I had to let go and trust. That process was HARD. I have had to let go of the idea that I can do things on my own and to learn to ask for help. Of course that meant asking my therapist for help, my husband for help, surrounding myself with people and influences which were uplifting and positive, setting boundaries and saying “no”…but ultimately I had to learn to trust in a merciful and loving God, who I knew was waiting for me on the other side of that door. There have been many sacred and special experiences along that road, too tender to share. However, in those moments I have felt completely known and understood and accepted, just how I am – imperfections and all. In fact, He wants me as humble, honest, authentic and real as I can be. It’s only in those moments that His healing work can be done. It’s also in those moments that I feel overwhelming love and have been blessed with the knowledge that He has a plan for me and as I trust Him, He will show me the way. I can be led by His light; the light that led me out of the dark room to something far greater than I could ever achieve on my own. He has never left me or given up on me and is worthy of all our trust. He’s been patient with me when trusting felt too hard. God taught me who I am, and He provided a way for me to return to Him, through my trials, weaknesses and imperfections. Don’t stay in the dark room. There is no need to do this alone. Ask for help, learn to love and hold on to hope that all will be right in the end. My mom sent me this quote a few months ago and I printed it and put it on the refrigerator where we could all see it many times a day. I read it often – it describes perfectly how I feel when I am hopeful. 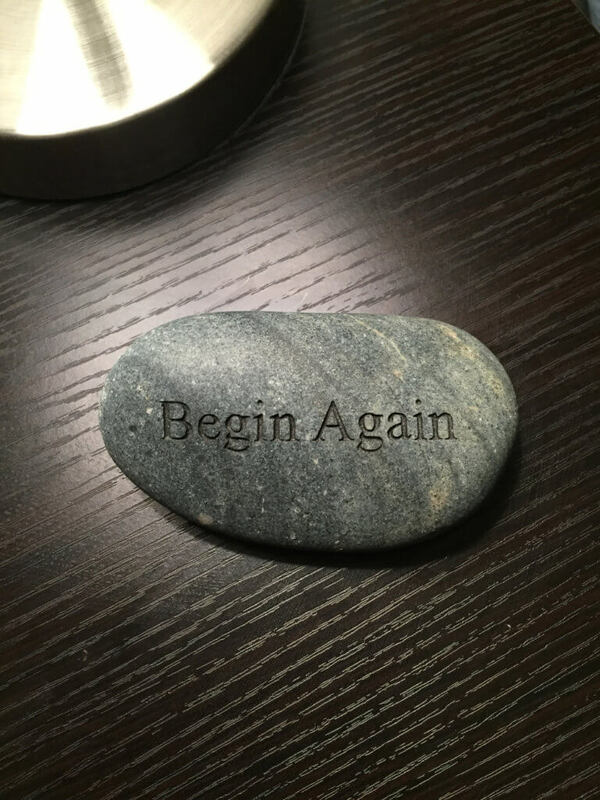 My therapist gave me this rock with her favorite saying “Begin Again”. It reminds me that when I lose track of the course, I can Begin Again. I believe in new beginnings. I believe that you’re never too lost, never too far gone, never beyond where light can shine. For me, Begin Again doesn’t mean start Monday to be perfect, it means that when I’m tempted to let pride or despair set in, I return to that place deep inside my mind and heart where wisdom and love lives. When the world gets loud, I go there and that’s where I feel and see that bright light I chose to follow. My hope is that something here has whispered truth to your mind and heart and at the very least you know that you are worthy of love, especially your own. I hope you’ll choose to trust and to open your heart to hope. Such a wonderful, amazing and caring reminder, thank you. This is brilliant. Loved it. Every word. Beautifully written!! Emmy this was so eye opening and honest. I love it. Thanks for sharing. You truly are a light in this world. Thank you Christina! It felt good to share it, and I hope others benefit from what I learned the hard way. Miss you! I am so grateful to have come across your blog today. For a while now, I have been searching endlessly for inspiration while recovering from Orthorexia and reading these blog posts make me feel a tremendous amount of peace and joy. Thank you so much, you are truly doing something beautiful for the world. Thank you so much for this! As a lifelong perfectionist trying to let go of that part of myself, I needed to read this. I really like what you said about healing coming from the inside out and confusing physical needs with spiritual ones. That hit home for me because in my struggle to learn to eat intuitively, I have been more focused on food than on God and that has done nothing but hurt my progress. Thank God for grace! <3 <3, so glad Kaylyn!